Is it always fairly noticeable, a less than subtle reminder of a previous injury of some sort or of a surgical procedure? Does it necessarily have to be somewhat wide? Elevated? Thick? When the term “scar” is brought up, many people conjure up an image of something unpleasant or disturbing in appearance – possibly red, elevated and even wide. However, it doesn’t have to be this way. Scars just don’t get “no respect”. In reality, they are the enduring and final result of the body’s amazing and complex mechanism of the healing of wounds. Such wounds can be the result of trauma, bites, burns, piercings, infections, surgery or even self inflicted or placed. Except for the most superficial injury or cut, a wound of the skin will result in a scar which is permanent. Multiple factors play a role in the ultimate scar that develops from a given injury or as a result of a planned surgical procedure. Some wounds heal with fine imperceptible scars whereas others may end up being wide, irregular, unattractive, tattooed, thick, elevated and/or painful. The special cases of hypertophic scars, keloids and burn scars are discussed in other sections. How can a wide and/or elevated undesirable and possibly conspicuous scar be improved? 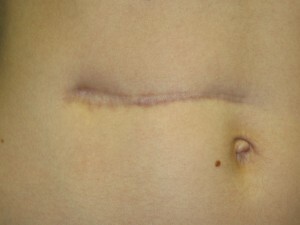 Usually by scar revision surgery. Scar revision surgery is the generic term used to describe any of a multitude of surgical approaches that a plastic surgeon uses which is designed to improve the appearance, symptoms or problems associated with a less than ideal scar. Most involve the excision of the offending site with a meticulous closure that can employ one or more of a variety of techniques. The procedure may yield a scar that is far less perceptible but it cannot magically erase it without leaving a trace. Postoperative care is also important in attempting to obtain the best possible outcome. Topical agents such as silicone gel, silicone gel sheeting or Mederma® can be helpful in this regard. It is also important to protect the site from significant sun exposure for at least six to nine months. Regular application of a high SPF broad spectrum sunscreen is recommended (full UVA coverage and a 45 SPF or higher for UVB protection).